Home Blog How to Learn Hindi for Competitive Exams? ‘Namaste’ is a Hindi salutation which means Hello, an excellent place to start right. It’s one of the basic word there is in Hindi and what best way can a beginner learn the language rather than first know the commonly used phrases such as, how are you, Thank You and the like. Well, you will need the initial motivation before you even get down to learning the alphabets and numbers. Just saying a phrase right and a native Hindi Speaker smiles in surprise only at how great you can be being a motivation. I have heard people repeat time and time that learning Hindi is hard. Well, I do not crystal clear understand where the notion is from, but generally not foreign language is easy to learn. One thing I find interesting in Hindi is how the characters, symbols, and alphabets are written let alone pronounced. I bet this is why people believe Hindi is challenging to learn. That is why it is essential that even before you begin the study, first establish why you need to learn, what you want to learn and how you want to learn. It will provide a solid ground from whence you will keep at regardless of how the route may be tough and bumpy. First forward, even with an admirable sparkle of interest in Hindi, a beginner need more than that. They need to understand that you will spend a lot of time learning Hindi, sad but the truth; I know many sites promise you to learn Hindi in 30 days or thereabout, it’s a lie. Learning cannot be done that first, allow me to pre-empty you least you get disappointed. There is a learning curve involved which can be short or long subject to your ability to absorb concepts and how you are keeping at it. Secondly, you need to dedicate yourself into the study. Well, this may sound demanding but yes, it’s necessary. 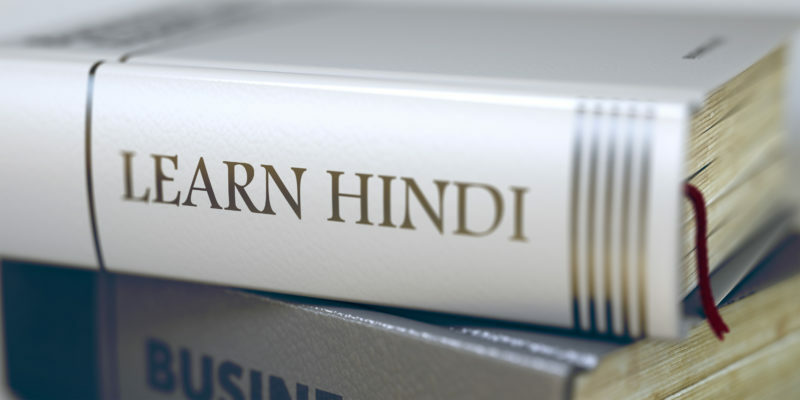 If your purpose in your mind that Hindi is what you want to learn then you will achieve just that, if you have no intention, then this will only be a dream far-fetched. Your time, efforts and resource should be vested in learning Hindi. Last but not least, a Hindi student should understand that motivation is the key to learning. Well, from the onset, it may appear a brilliant idea, but getting down to studying may turn out to be murky waters you are in. You need to be motivated to push through. It makes it hard for a self-taught Hindi learner as they may not have the motivation to draw from. It is therefore advisable to connect physically or online to other beginners, share your experiences, what has helped you so far, useful tools and just encouragement to push. Hindi is the native language in India, although not recognized as the official language because the Indian Constitution does not provide such a provision. Nevertheless, it is the most prevalent and by default the official language alongside English. It is the fourth most spoken language globally after English, Spanish, Mandarin. Indians are an ethnic group that has migrated and moved to almost every country in the world. Most countries take recognition of this race. Going by the 2016 census report, there are about 322 million native Hindi Speakers in the world. According to the Hindustani history, Hindi is one of the Indo-Aryan languages that came from descendant Vedic Sanskrit in 7the Century AD. The language has since then evolved to have many dialects such as Khariboli, Hindustani, Indo-Iranian, Indo-Aryan among others. Well, this one does not necessarily imply that in a week or a month you will be a pro in speaking and writing Hindi, no. It means that it is a short and effective route on can follow in learning Hindi for competitive exams and by extension in communication. The following steps apply regardless of the use of other tools and technique online in how to learn Hindi for competitive exams. Devanagari is the Indian script of alphabets and numbers used in writing Hindi and Marathi. Characters are written from left to right in a distinct way with a small lateral line at the top of letters that links them. This script is a guide into how numerals are written, alphabets, consonants, vowels and simple combinations of both. It is available in Hindi Libraries and online if you are sourcing reading materials from the web. They are standard, so there is no worry of uniformity. There are 11 Hindi vowels which can either be used by themselves or join a consonant in a word. They are represented in symbols with some having diacritic marks or modifying characters to show how they show be pronounced. Hindi consonants are the most elaborate as there are 33 consonants in the Hindi language. It then should be a keen area in learning the Hindi alphabets and with the primary purpose to score high in exams. There are nine categories; the Velar consonants, retroflex consonants, glottal, labial, dental, sibilant, palatal, flap, and semivowels. At this stage, one is not expected to know all the consonant so worry not, it’s a gradual process that requires time to comprehend all. However, it’s an integral part that should be taken seriously. In the process of time learn the different types of consonants; differentiate the voiced from the unvoiced and then aspirated from the unaspirated. It can be achieved through listening to the tutorial online and even on YouTube guides to tell apart in pronunciation. If you now know the Hindi vowels and consonants, the wording is now straightforward. Get to the next advanced level of grammar. It entails many things such as nouns, pronouns, prepositions, adjectives, verbs, conjunctions among others. It is from this you will be able to write and read phrases, then sentences, paragraphs then stories. In the same vein learn the generally accepted rules in grammar and communication especially those that apply to gender, time and tenses. It is on your way to performing well in your Hindi exams. It cannot be overemphasized, it’s the critical thing in how to learn Hindi for competitive exams. Well, now that you have mastered the alphabets, you are familiar with the Hindi Script and can on amateur level read and speak some few words, work on generally improving your written and spoken Hindi. Practice will perfect everything as well as introduce you to other new concepts in your revision and course of study. Have valuable library sources that will help you, watch Hindi movies, got through the tutorial and always remember that this is a routine thing you have embarked. Keep at it!